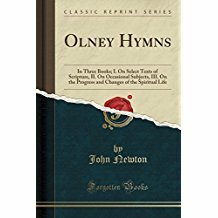 Excerpt from Olney Hymns: In Three Books; I. On Select Texts of Scripture, II. On Occasional Subjects, III. On the Progress and Changes of the Spiritual Life This publication, which, with my humble prayer to the Lord for his blessin u n it, I offer to the service and acceptance of all w 0 we the Lord Jesus Christ in smcerity,of every name and in every place, into whose hands it may come; I more particularly dedicate to my dear friends in the parish and neighbourhood of Olney, for whose use the hymns were on ily composed, as a testimony of the sincere love I ear them, and as a token of my gratitude to the Lord. And to them, for the comfort and satisfaction with which the discharge of in ministry among them has been attended. About the Publisher Forgotten Books publishes hundreds of thousands of rare and classic books. Find more at www.forgottenbooks.com This book is a reproduction of an important historical work. Forgotten Books uses state-of-the-art technology to digitally reconstruct the work, preserving the original format whilst repairing imperfections present in the aged copy. In rare cases, an imperfection in the original, such as a blemish or missing page, may be replicated in our edition. We do, however, repair the vast majority of imperfections successfully; any imperfections that remain are intentionally left to preserve the state of such historical works.